For the second year in a row, Greater Cincinnati has been ranked the most sustainable metro area in the nation by Site Selection Magazine. The 2018 ranking was based on corporate practices, as well as their contribution to people, communities and the planet. Green Umbrella, Cincinnati's region sustainability alliance, has begun work to help keep this top ranking by leading the creation of a 2030 district within the city. There are 20 active 2030 Districts across the US with the goal to create a model for urban sustainability by getting property owners within the district to reduce their building's energy use, water consumption and transportation emissions by 50 percent by the year 2030. “These shared goals (energy, water, transportation and health) will help attract and retain top talent, advance us toward achieving shared goals and help each member save money in the process,” said Chad Edwards, founding member of the 2030 Working Group and architect at emersion DESIGN. While the immediate plans are for the Downtown business district, in the future, 2030 Districts are plotted for Clifton/Corryville, Covington, Newport and Bellevue. Green Umbrella is initiating this movement completely separate from local government. Currently, the organization is seeking sponsors and outside funding, but once the program is implemented, the involved businesses will pay an annual membership fee to the bill. What will it take for Cincinnati to get a 2030 District? "The planning process started seven months ago with interested folks to discuss if this would work in Cincinnati, if it would have an impact. We were promoted to Prospective 2030 District status in June now we're in the mode of official recruitment status," said Ryan Mooney-Bullock, Executive Director of Green Umbrella. In order to establish an official and national recognized 2030 District, 10 property owners, or 10 million square feet of commercial space or 10 percent of the total commercial square footage within property boundaries must commit to being a part of the district. "Just as a point of reference, there is over 12 million square feet of lease-able commercial space in just the 25 largest commercial properties downtown," Mooney-Bullock said. Green Umbrella hopes to have a nationally recognized 2030 District by the end of 2018. For the second year in a row Greater Cincinnati has been ranked as the most sustainable metro area in the nation by Site Selection Magazine. Using a diverse, data-rich index , the magazine looks at corporate sustainability practices, characteristics of the commercial building stock and community efforts that positively affect both the planet and residents’ well-being. The 2018 ranking by Site Selection’s Sustainable Sites index draws attention to the value that corporations place on investing in communities that prioritize the well-being of people and planet. Green Umbrella, the region’s sustainability alliance, is working to make sure Cincinnati keeps this top rating for many years to come by leading the development of the Cincinnati 2030 District. 2030 Districts – a national model for urban sustainability – are made up of property owners who make a collective commitment to reduce their building’s energy use, water consumption, and transportation emissions by 50 percent by the year 2030. The Cincinnati 2030 District, which includes Bellevue, Covington and Newport in Northern Kentucky, will be a high-performance building district that aims to dramatically reduce environmental impacts of building construction and operations through education and collaboration across every sector of the built environment. The City of Cincinnati’s Green Cincinnati Plan ranks the creation of a 2030 District as one of the largest opportunities to reduce greenhouse gas emissions in the city’s built environment. Interested real estate owners, managers, developers, industry professionals, and community stakeholders in the downtown core (see map) should visit cincy2030.org or email cincy2030@greenumbrella.org to learn more about the benefits of 2030 membership and how to get involved. The 7th Annual Pedco High Performance Buildings Seminar on October 4 will feature a panel made up of 2030 leaders from Detroit, Cleveland and Pittsburgh and a presentation about the Cincinnati 2030 District. Filmmakers from Newsy are documenting the process of getting the Cincinnati 2030 District off the ground; you can view the trailer online. For the second year in a row, the Cincinnati metro area is ranked as the most sustainable metro area in the nation by Site Selection magazine. The magazine examined corporate sustainability practices, characteristics of the commercial building stock, and community efforts that positively affect the environment and residents, a news release said. Green Umbrella, a locally-based sustainability alliance, said in a news release that it wants to see Cincinnati maintain the top rating for years to come. 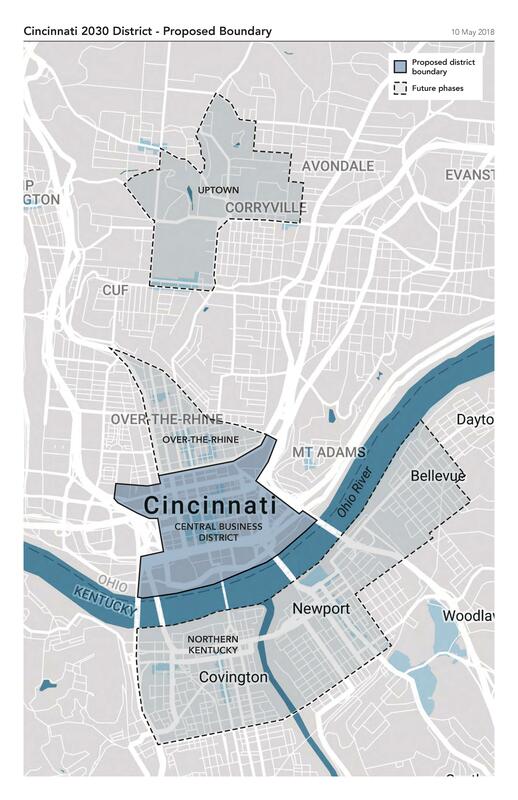 The organization is leading the development of the Cincinnati 2030 District. 2030 Districts - a national model for urban sustainability - are made up of property owners who make a collective commitment to reduce their building’s energy use, water consumption, and transportation emissions by 50 percent by the year 2030. The Cincinnati 2030 District will be a high-performance building district in downtown Cincinnati that aims to dramatically reduce environmental impacts of building construction and operations through education and collaboration across every sector of the built environment. The City of Cincinnati’s Green Cincinnati Plan ranks the creation of a 2030 District as one of the largest opportunities to reduce greenhouse gas emissions in the city’s built environment. There are 20 active 2030 Districts in the US, with Cincinnati seeking to become the 21st. The next step in forming the Cincinnati 2030 District is getting commitments from founding members who are ready to use their property to advance bold sustainability goals. Filmmakers from Newsy are documenting the process of getting the Cincinnati 2030 District off the ground. You can view the trailer online. Is the Greater Cincinnati region prepared to respond to a changing climate? How are other cities making sure they are resilient in the face of extreme weather events? At the 4th annual Midwest Regional Sustainability Summit, 350 attendees explored how local municipalities, businesses and peer regions are adapting to climate change and other environmental challenges. Participants discussed how to work towards shared goals by advancing regional agendas like Cincinnati USA Regional Chamber’s The Connected Region, the City of Cincinnati’s Green Cincinnati Plan and Green Umbrella’s 2020 Goals. Nine breakout sessions dove into topics such as extreme weather preparedness, green jobs, reducing food waste, local food systems, and sustainable business practices. To underscore the theme of resilience, the keynote speaker was Katharine Hayhoe, director of the Climate Science Center at Texas Tech University. Hayhoe’s current focus is on modeling regional to local impacts of climate change, and how we can fix this together using many of the solutions already in our backyards. She shared best practices on communicating around complicated and polarizing issues like climate change. “Climate change is not simply an environmental issue. Climate change is a threat multiplier,” said Hayhoe. Chief Resilience Officers from Pittsburgh and Louisville joined Dr. Hayhoe for a plenary panel to discuss how the cities and businesses in our region can best adapt to climate change. These cities are part of the Rockefeller Foundation’s 100 Resilient Cities program, which helps urban municipalities prepare for a variety of shocks and stresses. 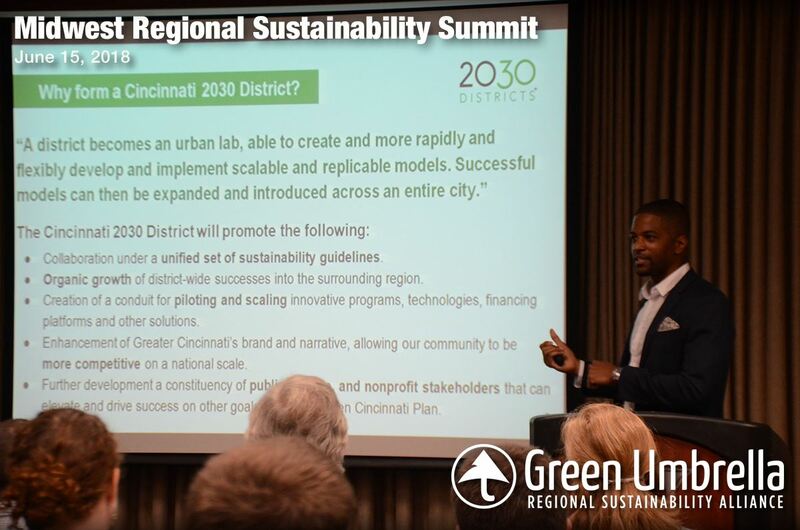 One breakout session, “A Sustainability District in Downtown Cincinnati,” announced the launch of a 2030 District, which will set targets for reduced environmental impacts from downtown buildings in energy, transportation and water. The team debuted a trailer for a documentary that is chronicling the collaborative process to develop the Cincinnati 2030 District. “The Summit is about bringing the region’s sustainability advocates together to share best practices, celebrate accomplishments and identify areas for future collaboration,” says Ryan Mooney-Bullock, Executive Director of Green Umbrella. The Midwest Regional Sustainability Summit was presented by Green Umbrella in partnership with the City of Cincinnati and The Brueggeman Center for Dialogue at Xavier University. Green Umbrella, the City of Cincinnati, and Xavier University have partnered to host the fourth Midwest Regional Sustainability Summit on June 15 at the Schiff Conference Center on Xavier’s campus. 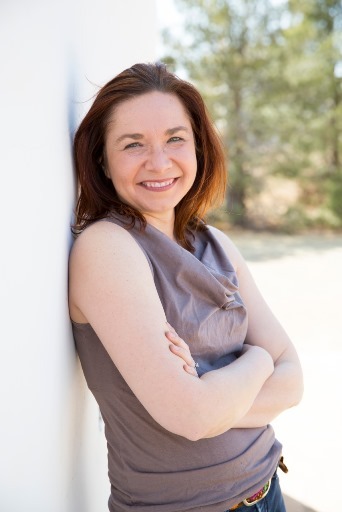 Keynote speaker, Katharine Hayhoe, director of climate science center at Texas Tech University is well respected in her field. She will discuss environmental issues, sustainability, and resilience; consider how other regions are adapting to climate change, and address some misconceptions on climate change and global warming. As the population grows, the issue of food--from growing to distribution--becomes increasingly important. For an increasing minority of folks, the answer lies in getting back to basics--growing food in more traditional ways, and making sure it stays in the region for locals to enjoy. 10 years ago this month, Soapbox ran a piece about local food in Cincinnati. As part of our 10 year anniversary series, we examine how local food has changed in the past decade, and where it might be in the future. According to Kristin Gangwer, Interim Executive Director of local sustainability nonprofit Green Umbrella, there is cause for optimism. “We’ve measured that number of outlets to purchase or consume local food has quadrupled since 2010.” The demand has increased, and the places to tap into local food now include everything from farmer’s markets to restaurants to “food hubs” to direct from farmer community supported agriculture CSA programs. Traditional farmers markets continue to thrive, with upwards of 40 markets happening seven days a week throughout the region. The Central Ohio River Valley (CORV) Local Food Guide, an annual publication, highlights the markets and other sources for local food. 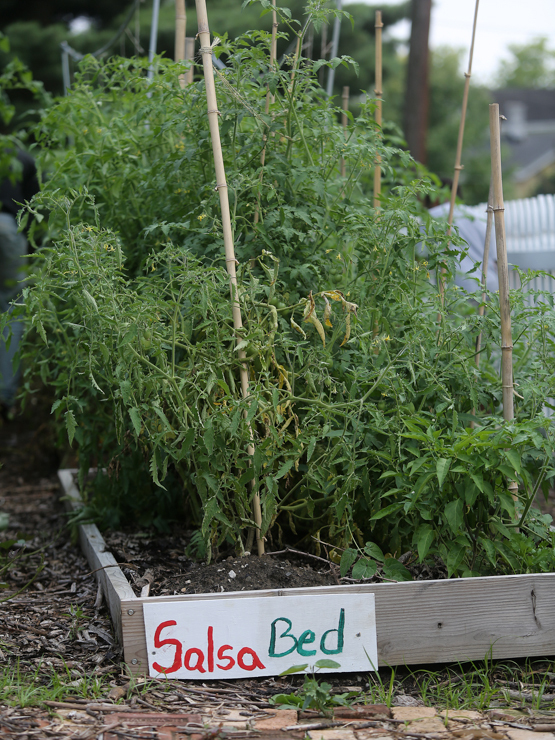 According to CORV Producer Deborah Jordan, the guide was started in 2008 as a grassroots effort to connect community members with local growers and fresh, healthy local food. Jordan explains that the guide “went from 8 pages in the beginning to 24 today,” reflecting the explosion of interest and availability of local food in the past decade. Access to local food has also been helped by advances in technology. Local Food Connection, one of two “food hubs” in the region, was started in 2015 to improve access to fresh produce for families and restaurants. “Our mission is to make it more convenient for buyers to buy locally as other foods. On the supplier end, we make it more convenient for farmers to market and distribute products,” explains founder Alice Chalmers. 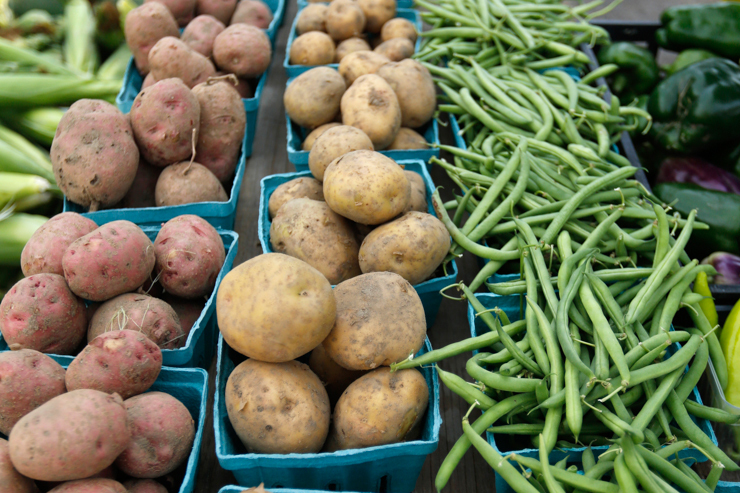 Produce, meat, dairy, and other local products are available for purchase online. “We’re like an Amazon.com for local food. You can buy as much or as little as you want, when you want.” After placing an online order, buyers can pick up their produce at one of eight local locations. Local food access has also improved through innovative programs that improve affordability for people with limited incomes. Due to governmental produce subsidizes and large chain stores driving down prices through bulk buying, consumers have become accustomed to low prices on staples such as milk and produce. For many, the price of buying local can seem prohibitive. “Food can be so cheap, people still underestimate the real cost of producing food,” said Chalmers. “There can be sticker shock on pricing.” Programs such as Produce Perks are helping to address this barrier to eating local. Produce Perks is a local nutrition incentive program that allows people who are on federal assistance such as SNAP to double their dollar at participating farmers markets. “This allows people to go to a farmer’s market and buy $5 of produce with their EBT card and get $10 of food,” explained Gangwer. On the flipside, Green Umbrella is working to reduce food waste that comes out of restaurants. Their “Save the Food Cincinnati” campaign aims to keep food from landfills through advocacy and education. “We give out awards/grants to projects and organizations who do creative work to reduce food waste,” said Gangwer. “Everything from gleaning extra produce from the fields that can be donated to the food banks to supporting organizations like La Soupe, which does food rescue projects.” Green Umbrella also has a Local Food action team, which is working on a 10% Shift campaign to encourage consumers to pledge 10% of their food budget to buying local food. Those working in the local food scene see incremental progress happening. “Having worked in the food system for a while, I feel really positively about where things are heading,” said Gangwer. Generational shifts in values are also driving demand for local food. 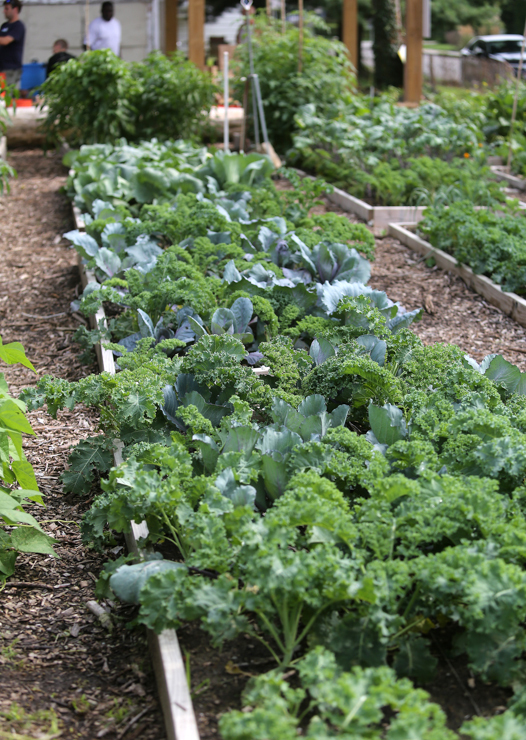 Access to local food has become “the expectation among millennials,” according to Chalmers. 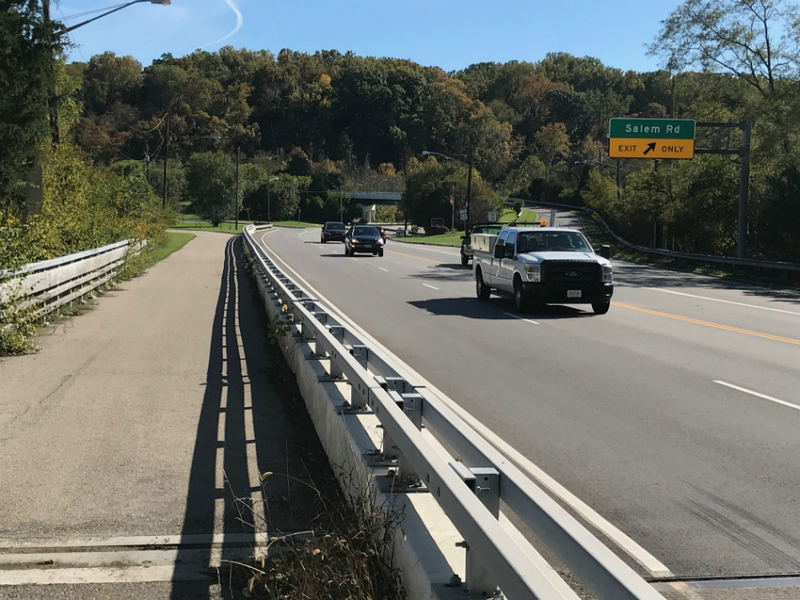 It has been a big year for bike trails in Greater Cincinnati, with several major updates to big projects in Hamilton County and Northern Kentucky. Wade Johnston, of Mount Washington, heads up Tri-State Trails, a nonprofit that works to boost community efforts toward building bicycle and pedestrian infrastructure. He sees trails as a way to empower those who can't afford to own a car. "Trails provide an equitable transportation option for those who might not have access to a vehicle," he told WCPO. "They also provide a really unique opportunity to connect our communities, connect our business districts, connect our residential areas to our employment centers, and it's really an economic development tool." 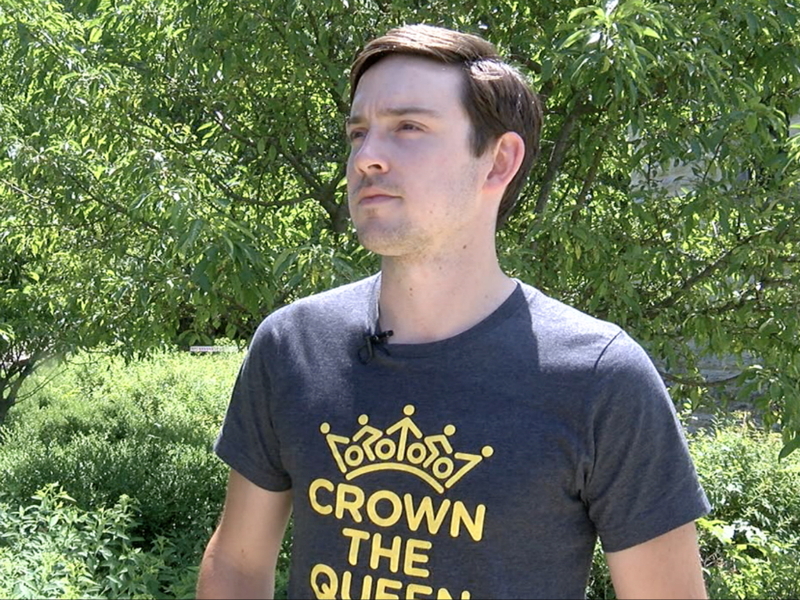 READ MORE: Could proposed trail network 'CROWN' Queen City among the best? Johnston sees trails as a tool for connecting a region -- neighborhood by neighborhood. "A lot of the work we're doing is elevating the work of communities to think beyond their jurisdictional footprint and plan to connect with their neighboring communities," he told WCPO. Johnston is a dedicated bike commuter, and he can be seen often on the city's East Side bike trails, including the Little Miami Scenic Trail. This is where he sees the Tri-State's biggest foot forward over the past year. Funding came in last year for a bridge that would connect the trail to Downtown. That money and that bridge are both expected to arrive in 2021, Johnston said. Construction began last fall on the much-anticipated Wasson Way Trail project -- a four-mile mixed-use trail that will connect 10 neighborhoods once completed. The first phase is about a mile, and crews are currently working through Hyde Park. "That will be an important connection to link some of the East Side neighborhoods to Uptown," Johnston said. "We're really looking forward to pushing the connection to Avondale and Uptown. We think that will provide tremendous utility to connect neighborhoods to the second-largest employment hub." The Wasson Way project has seen huge support from the surrounding communities, Johnston said. "Overall, I've heard overwhelming support for the Wasson Way trail," he said. "Having a safe bike and pedestrian corridor traversing through densely populated residential areas with a lot of commercial nodes, I think, is really going to transform the way that people think about biking in Cincinnati because they'll see how accessible it can be." The Ohio River Trail winds along the riverfront from Downtown to East End -- for now. It eventually will connect to Clermont County and beyond, thanks to a cooperation between the city of Cincinnati and Anderson Township, approved late last year. The two-mile connection initially hit a snag last fall when funding was diverted from the project, prompting Anderson Township, Hamilton County and Interact for Health to kick in additional funds to get the connector built. It's a small bridge but a big step, Johnston said. The Little Miami Scenic Trail is the Tri-State's primary connection to the Ohio-to-Erie Trail, a more-than-300-mile trail wrapping around the entire Buckeye State. Once built, the bridge will cross the Little Miami River near Lunken Airport, giving bicyclists a dedicated path from downtown Cincinnati to the 80-mile Little Miami Scenic Trail. 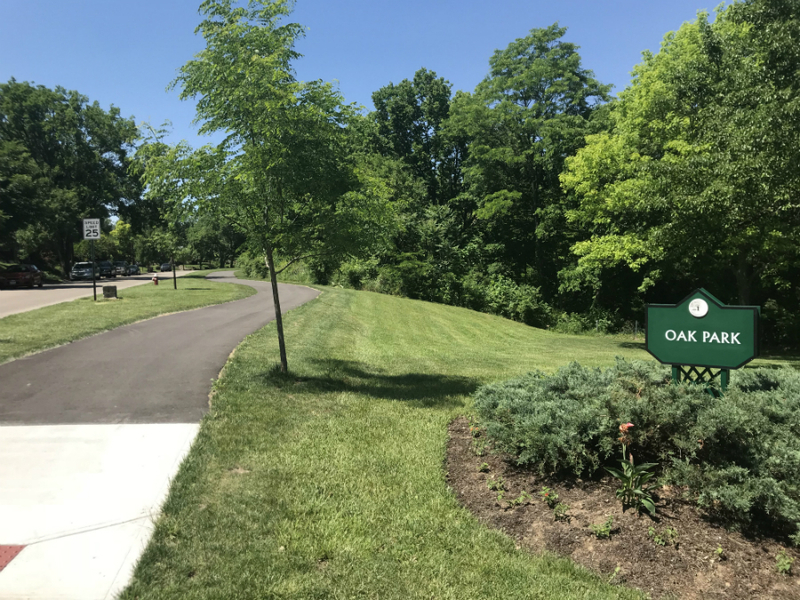 The latest phase of the Mill Creek Greenway trail wrapped up last year, with the West Fork stretch extending down to Oak Park in the suburb of Wyoming, Ohio. The Mill Creek Greenway also runs through Cincinnati's West Side, extending from South Cumminsville to Spring Grove Village, with plans to expand the trail down to the riverfront and up through Winton Hills and Carthage. An 11-mile trail connecting six Northern Kentucky cities is well underway and got two new stretches last year, one along Covington's flood wall and another stretching through Ludlow. Once completed, the Riverfront Commons trail will connect Ludlow in Kenton County to Fort Thomas in Campbell County. The West Walk portion of Riverfront Commons in Covington is one of two phases planned for the city. The second phase will include fountains, sculptures and waterfalls. But because the trail runs along the riverfront, erosion might cause a problem. That's why the Army Corps of Engineers will need to step in to ensure the integrity of the structure. 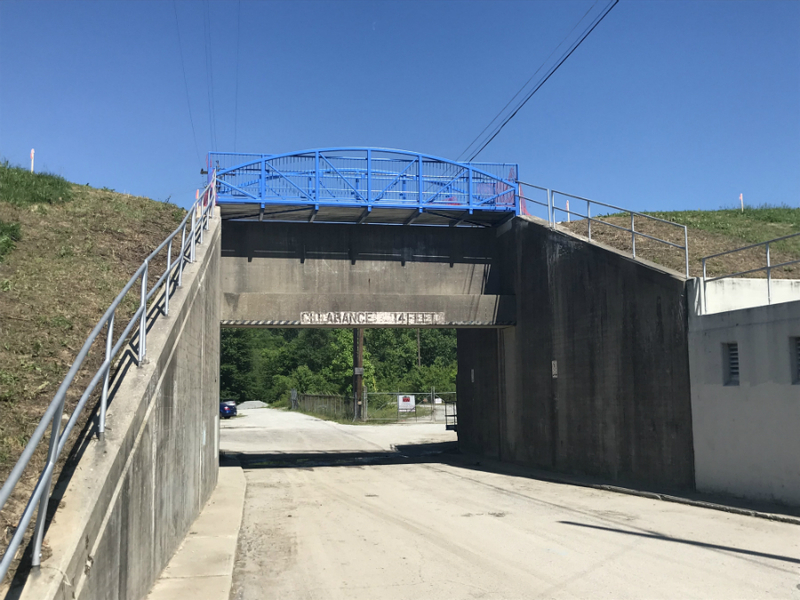 A bit farther south in Northern Kentucky, the Licking River Greenway and Trails hit a major milestone earlier this month, when a pedestrian and bicycle bridge came in over the 16th Street floodwall in Covington. 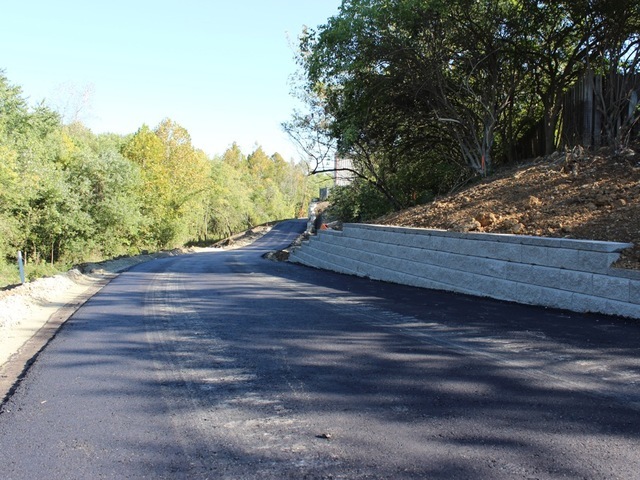 Phase one of the Licking River Greenway and Trail was completed in 2014 and saw construction of a paved portion starting just north of Wallace Woods at 21st Street and stretching a half-mile north to Thomas Street. Phases two and three have begun to extend the paved trail north to Randolph Park at Eighth Street. A fourth phase will tie in with Riverfront Commons. Pat LaFleur reports on transportation and mobility for WCPO. Connect with him on Twitter (@pat_laFleur) and on Facebook. A Cincinnati nonprofit focused on sustainability has a new top leader. Green Umbrella on Monday named Ryan Mooney-Bullock as its next executive director effective June 25. She succeeds Kristin Weiss, who resigned in March after three years to spend more time with her family. Mooney-Bullock, who was the group’s Communications and Program Manager, joined Green Umbrella in 2011. She previously did research at the Center for Neighborhood Technology, an urban sustainability think tank in Chicago; taught science at Princeton High School, and developed and managed the Civic Garden Center's Green Learning Station. She earned a bachelor’s degree in environmental studies at the University of Chicago and a master’s degree in environmental science from Antioch University New England in Keene, N.H.
“Ryan's support of Green Umbrella’s Action Teams over the last seven months has helped them strategically advance their progress on our 2020 sustainability goals. I am looking forward to working with her as we take Green Umbrella to its next level," Bill Scheyer, Green Umbrella board president, said in a statement. 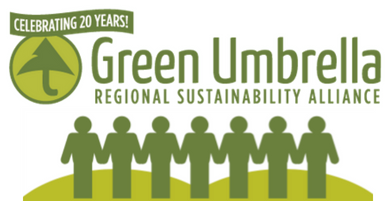 Green Umbrella, founded in 1998, is a regional sustainability alliance working to ensure that Cincinnati remains one of the 10 most sustainable metro areas in the country. In October, Cincinnati was named the No. 1 metro area in sustainability by Site Selection Magazine. “I look forward to making sure sustainability resonates with everyone – whether it is through employment opportunities, access to greenspace to get outside, viable transportation options, clean water, affordable energy, healthy food that supports our local economy, or creative solutions to waste,” Mooney-Bullock said in a statement. For information about Green Umbrella, click here. To Bike Or Not To Bike Around Cincinnati? With more dedicated on-street bike lanes, an expanding system of riding trails, a bike-share system and several active cycling clubs, Greater Cincinnati is a far more bike-friendly city than it was just a decade ago. Still, many believe Cincinnati is not doing nearly enough to promote biking and making cyclists safe on city streets. May is National Bike Month, and joining "Cincinnati Edition" to discuss biking in our region are Social Organizer Jasmine Humphries, who started the Red Bike & Green cycling club in Cincinnati; Ohio’s Bike Lawyer Steve Magas; Red Bike Executive Director Jason Barron; and Wade Johnston, director of Tri-State Trails, a Green Umbrella initiative to expand access to walkable and bikeable communities. Tune in to "Cincinnati Edition" May 8 starting at 1 p.m. to hear this segment. Spring has finally arrived in the tri-state, just in time for Bike Month! Join the bicycling community in Cincinnati and Northern Kentucky to celebrate throughout the month of May. Bike Month is a collection of nearly fifty events to celebrate all things bicycling in Greater Cincinnati. 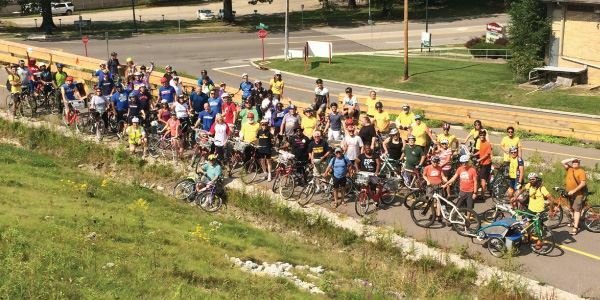 There are all kinds of themed group rides to participate in—for beginners and avid riders alike—whether you’re an enthusiast for donuts or beer or historic preservation. There are numerous events to do off your bike too, like a bicycle-themed board game night, a live recording of The Gravel Lot podcast, and a special screening of Pee-Wee’s Big Adventure. Check out the event calendar at CincyBikeMonth.com to view a full listing of events. Bike Month is a national event organized by the League of American Bicyclists. Tri-State Trails and Queen City Bike are partnering to celebrate locally in Greater Cincinnati. Bike Month is made possible with support from Great Parks of Hamilton County, Ohio‘s Bike Lawyer Steve Magas, AAA, and Reser Bicycle Outfitters. Additional sponsors include Red Bike, Cincinnati Cycle Club, Cincinnati Off-Road Alliance, Cincinnati & Northern Kentucky Family Magazine, Metro, TANK, and Spun Bicycles. An initiative of Green Umbrella with funding from Interact for Health, Tri-State Trails is an alliance of trail advocates advancing a vision to connect and expand our region’s trail network. Our mission is to connect people and places with a regional trails network that enhances vibrancy and equity in our community. For more information, visit www.tristatetrails.org.